1. Ricky Ponting scored 242 in the first innings of Adelaide test against India in 2003, only to be out on 0 in the second innings, with Australia losing the match. 2. India reaching English shores in 2011 as best ranked Test side and on a high after winning the ODI world cup just few months ago, only to be whitewashed and lose their spot at the top. There are innumerable such instances. One such instance was witnessed today in Pune, after Australia’s monumental win against India. Decimated. Humiliated. Vanquished. Conquered. These are some of the adjectives that many publications would be itching to use to describe the mauling India received in the first test of the series. A series, whose result most experts and ex-cricketers had already predicted to be a foregone conclusion. Presumably, Australia’s only victory seemed to be if they managed to draw a test match and save the embarrassment of yet another whitewash in Asia. But Steve Smith’s side has turned the tables! And how! A win by 333 runs in India. India suffered their 2nd largest defeat in terms of runs on their own soil, narrowly avoiding their worst ever loss. And that too, on a rank turner. I am sure everyone would be reminiscing the winter of 2015, when South Africans had arrived here, only to be welcomed by not just turning pitches from day one, but literally dust bowls! India had smothered them and since started their undefeated run at home. New Zealand and England suffered the same fate. An undefeated streak of 19 tests; Team India was almost invincible, especially at home. Then came the Aussies! Everyone was eagerly waiting for them. Everyone was half assured of second consecutive white wash of the kangaroos in India, given their miserable outing in Sri Lanka last year. Some people even went ahead and termed this as the weakest Australian team ever! I am sure team India would not have taken the Aussies lightly at all, because of their experience and the level of competition at the highest level. But still, they could not get away from the ignominy of facing one of their worst ever batting displays at home. Only 74 overs faced in the match by India, the least ever by them. Ample example of the lack of application by the world class batsmen. One can’t help but be reminded of the web spun by the English spinners Swann and Panesar on the tour of India in 2012. That time also, not many gave the English team a chance. But their spinners fared better than ours, better said; our batsmen were not up to the task. There is a similarity between that English side and this Aussie side. Alastair cook at that time was on the rise in his career as a captain and the young team had lot of hungry performers. This Aussie side too has a gritty skipper in Smith and some really talented and young players, ready to show their talent to the world. Today also, it was neither Mitchell Starc nor Nathan Lyon. The wrecker in chief was Steve O’ Keefe. A not so famous spinner, who now has etched his name in the history books forever. These are the kind of moments that make the game more enjoyable. To see the tide turn when you least expect it. And it has been the norm lately. England’s surprise series win during tour of South Africa last year, South Africa’s spirited and inspired performance to win yet another series in Australia and then, when Steve Smith and his side looked down and out, they have made a comeback to behold, starting from the day-night test in Adelaide. Some new faces, new energy, and the team is back on track. This is what makes the game more competitive and worth watching. 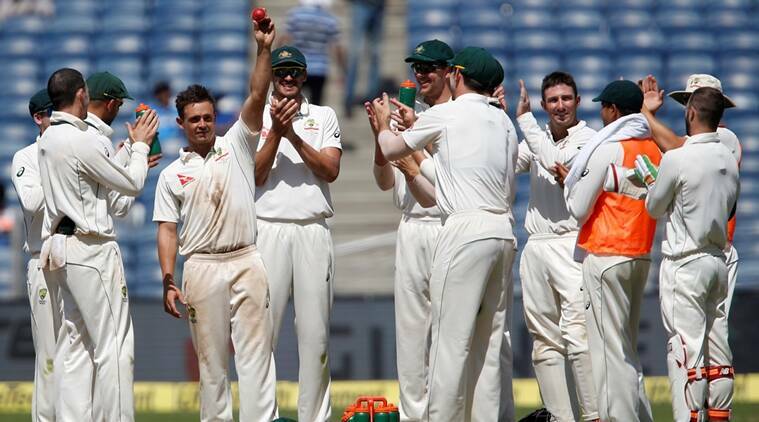 This India-Australia series was touted to be the ‘Test of the Best’. Ironically, it has become one now. India, the best test side in the world, is in for a stern test. Once again a not so famous spinner, not to mention a left arm spinner, has wreaked havoc on an Indian batting lineup which was averaging 514 runs/innings this season! Now will be the real test of the best. Steve Smith has shown his class by smacking one of his most memorable tons in the second innings of Pune test. Can Virat Kohli go a step ahead and break his own record by scoring double ton in 5 consecutive series? Can Ravi Ashwin and Ravi Radeja emulate O’ Keefe and take respective 12 wicket hauls in the upcoming tests? Can India take inspiration from England and come back and win the series like the English did when India toured in 2014 and famously won the Lord test? I am sure they have the firepower to do all this. Only thing is, having the self belief and confidence. I vividly remember the Press Conference of Virat Kohli after losing the Galle test in 2015. He seemed dejected after the collapse but still was confident of better results. What ensued after that was a historic undefeated run in Tests by Team India. His press conference of today was no different. If anything, he seemed even more confident that he did the last time. Is another record breaking undefeated run about to happen next? We all hope so, because that might seem to be the most obvious thing to happen, as Cricket is a great leveller!